As stated previously, the output of the constant volume pump is determined by pump rpm and the fixed angle between the drive shaft and the rotating cylinder block. If the angle was not fixed and could be varied, the piston stroke would be changed, thus varying the pump output. Changing the pump piston stroke is the method used on most variable volume pumps found in support equipment. The stroke reduction pumps (figs. 10-9 and 10- 10) are fully automatic variable volume pumps. The pressure compensating valves shown in both figures use system pressure to control and vary the piston stroke of the pump, thus changing the output. 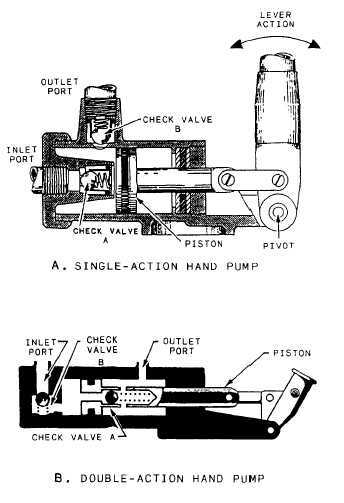 NOTE: The piston stroke of the pump (fig. 10-10) is determined by the angle of the cam plate. The drive shaft passes through, but does not touch, the inclined cam plate to rotate the cylinder block and pistons. The hanger assembly in figure 10-10 provides this same function as the cam plate in figure 10-9. The pumps may also be configured to allow manual volume control of the pump. Manual volume is controlled by a handwheel to vary the piston stroke or may use manual pressure compensating valves such as those used on many hydraulic test stands. HAND PUMPS. - The hand pump normally serves as a substitute for the main power pump on most hydraulic systems; however, the hand pump is widely used as the only power source in some equipment. Examples are hydraulic jacks, hydraulically actuated workstands, and similar equipment. The two designs of hand pumps you will be using are single action and double action (fig. 10- 11). The double-action hand pump creates the flow of fluid with each stroke of the pump handle; two strokes are required for the single-action pump. There are several versions of single- and double-action hand pumps but all operate on the reciprocating piston principle. The unit shown in figure 10-11, view A, consists of a cylinder, a piston, an operating handle, and two check valves-check valve A and check valve B. The inlet port is connected to the reservoir, and the outlet port is connected to the pressure system. As the piston is moved to the right by the pump handle, fluid from the reservoir flows through check valve A into the pump cylinder. As the piston is moved to the left, check valve A closes and check valve B opens. The fluid in the pump cylinder is forced out of the outlet port into the pressure line. Thus, with each two strokes of the hand, a single pressure stroke is produced. check valve A, a large piston rod, an operating handle, and check valve B at the inlet port.